Organizers of the Game Developers Conference have generously posted many videos of the sessions recorded at this year's show online. You need to be a member to see some of them, but there's no shortage of fascinating talks that are available for free. After looking through them, these are some of the free sessions we think you shouldn't miss. Virtual reality was without a doubt the theme of GDC 2015. Sony had a new Morpheus model, Valve demoed Vive, and Carmack was on stage talking up mobile VR. However, the most down to earth, realistic session I saw about VR at GDC was VR for Indies, where Darknet developer E McNeill, Max Geiger, Ben Kane, Holden Link, and Vi Hart talked about how smaller developers can take advantage of this new technology, or if they even should. They weren't there to pitch you on a new product. They just talked honestly about what can be done now, and can hopefully be done in the future. In this session, indie developer and game critic Liz Ryerson makes a really strong case for why we should stop chasing super realistic graphics and games that aim to emulate reality as closely as possible and instead consider the power of the abstract. It's not only a fascinating perspective, Ryerson also mentions several interesting games during her talk that you can download and play right now. Ever wonder why there aren't more women in eSports? This talk from professional players, Blizzard's Kim Phan, and Heather "SapphiRe" Mumm from the ESEA will not only tell you why, but what we can do to fix the problem. Look, I'm not even going to pretend that I understand what John Carmack is saying half the time, but I do know when I'm the presence of genius. 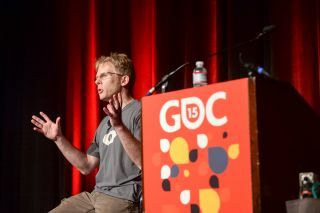 Carmack made Doom, he dabbles in rocket science just for kicks, and he's doing a lot of important work on the current resurgence of virtual reality. Here he's talking about mobile VR, but you'll learn a lot about Oculus in general, and it's always interesting to hear him talk. Divinity: Original Sin was easily one of the best games of last year, and a perfect example of what makes PC gaming so great. In this session, Larian Studio's Swen Vincke explains how they created Divinity. Spoiler alert: it wasn't easy. Speaking of some of the best game of last year, this session will tell you all about how Creative Assembly created PC Gamer's 2014 Game of the Year, Alien: Isolation. One of the coolest things about this session is that at some point Creative Assembly considered making Alien: Isolation a third-person game, and there's even the footage to prove it. If you play League of Legends, watching this session should be mandatory. Ryan "Morello" Scott, League of Legends' Lead Designer, and Frank Lantz, the Director of the New York University Game Center, discuss how Riot Games designs and balances an eSports sensation that over 70 million play every month. Lantz is a big fan of the game, Scott is surprisingly open, and it's really interesting to hear them nerd out about the design decisions, big to small, that make League of Legends tick, even if you don't play it. 2014 was a pretty difficult year for women in the games industry. In the #1ReasonToBe session, game developer Brenda Romero hosts a panel including game critic Leigh Alexander, developer Adriel Wallick, Uncharted writer and current creative director at EA Amy Henning, and others who work in different parts of the industry. They discuss the highs and lows of their experience in games, and how to create a more inclusive way forward.